Have you ever noticed the wide-spread use of “light” in December’s winter holiday celebrations? As we approach the Winter Solstice, colorful lights and candles often have symbolic meanings as well as their welcome bit of cheer – whether it is a public Tree Lighting Ceremony or candles within your own dwelling. Are you celebrating any cultural or religious holidays this month? May they all be filled with light! 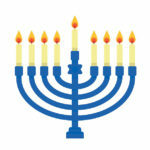 Hanukkah falls from sunset on December 2 until nightfall on the 10th for members of the Jewish faith this year. Hanukkah is known as the festival of lights, or re-dedication. Long ago, a successful revolt was made against oppressive Greek forces. Afterwards, their defiled Jewish Temple needed to be rededicated. They required oil to light the menorah in the Temple, but there was only enough oil remaining to burn for one day. It was supposed to burn throughout the night every night. Miraculously, that seemingly small amount of oil burned for eight days. Since then, the Jewish faith celebrates that miracle during the eight days of Hanukkah. A menorah holding nine candles is used for the celebration. It contains a candle to symbolize each night of the festival, with another called the shammus, which sits higher in the middle of the candelabrum. The shammus lights the other candles as they are added each night from right to left. Buddhists around the world will celebrate Bodhi Day on December 8. This is the day commemorating 2500 year ago when Siddhartha Gautama saw the morning star at dawn, attained enlightenment under the Bodhi Tree and became the “Awakened One,” better known as the Buddha. Buddhists often string beads, reflective ornaments and colored lights on ficus plants or strewn about their homes. The different colors symbolize the many pathways to enlightenment. The lights are turned on the night of December 8th, and then each evening for 30 days. Some Buddhists also serve cookies shaped like Bodhi trees or their heart-shaped leaves. Celebrated around the world by many cultures for centuries, The Winter Solstice occurs on December 21st, the shortest day of the year. The Feast of Juul is a Pagan celebration that began in pre-Christian Scandinavia. 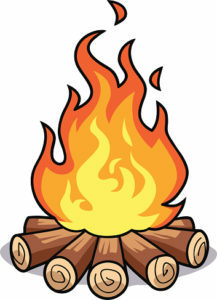 They gathered wood and lit huge bonfires to symbolize the heat, light and life-giving properties of the returning sun. Eventually a Juul log was introduced as the bonfire was brought indoors. It was burned on the hearth in honor of the Scandinavian god Thor. A piece of the log was kept for good luck, then the ashes were held beneath people’s beds to protect them from fire and lighting. Christians adopted a similar tradition, to be known as the Yule Log. Fireplaces and bonfires remain a popular way to celebrate the winter solstice. Celebrations around the world incorporate these fires to banish evil spirits, welcome or invite the return of the sun or otherwise cozy up together and listen to holiday music. 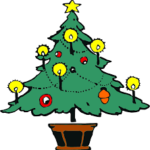 Decorating homes and Christmas trees with strings of lights for the Christmas season is a tradition celebrated by many Christians. This celebration often begins well before the actual holiday on December 25, sometimes as early as Thanksgiving. Tradition holds that Martin Luther, the 16th-century Protestant reformer, first lit candles on an evergreen tree to symbolize Christ as “the light of the world”. In the early 20th century, strings of electric lights became widely available and took the place of the open-flamed candles. Soon thereafter by the mid-20th century, Christmas lights became a widespread custom, on Christmas trees, strewn around the rooms of their homes, and outside along the outlines of houses and bushes. Created in 1966 to promote unity within the African-American community, the week-long cultural holiday Kwanzaa is celebrated from December 26 until January 1st. The kinara is a significant part of the celebration, which is a candle holder containing seven symbolic candles representing a different principle of Kwanzaa. A black candle is placed in the center to represents unity. To represent self-determination, cooperative economics, and creativity, three red candles are placed to the left. To the right of the black candle, three green candles represent the principles of collective work and responsibility, purpose, and faith. The black candle is lit on first day of the celebration, followed by the remaining candles which are lit from left to right throughout the remainder of the celebration. Did we miss any? I know the answer is yes, with the winter holidays of Saturnalia, St. Thomas’ Day, Shab-e-yalda, even Festivus could be thrown in there! And this is not even mentioning the New Year’s celebrations. Perhaps you are looking for a unit study? We have just the thing. This is a fun, multi-age unit study that is perfect for the whole family. You’ll travel the world while learning about five major winter holidays – Winter Solstice, Christmas, Hanukkah, Kwanzaa and Chinese New Year. 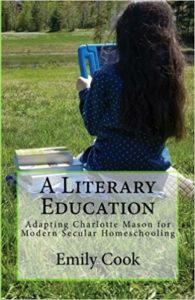 Unlike my regular unit studies, there is no schedule included, but rather a more open ended list of activities and books. This way you can take your time and explore the winter holidays at your own pace during the craze of the holiday rush. In our household, we typically blend some secular and religious themed festivities, from Hanukkah to Christmas to Scandinavian Solstice traditions with a Christmas tree with giant google eyes, Santa Claus, Yule Log (albeit a faux TV recording), candles, lights, advent calendars, Christmas countdown clocks and paper chains, Funko Pops adorned with Santa hats, and WAY too many cookies. We quite literally watch 20 versions of “A Christmas Carol,” (I have linked what I consider the “definitive” version, but am planning on following up with a full Christmas Carol book and movie adaptation run down soon), now three versions of The Grinch, as well as a host of other family favorites, like A Muppet Family Christmas, Elf, Prep and Landing, The Snowman, Home Alone 1 and 2, and Charlie Brown just to name a few. We read scads of holiday books, like The Night Before Christmas, as well as A Zombie Night Before Christmas (a favorite of the twins), Herschel and the Hanukkah Goblins, Guess Who’s Coming to Santa’s for Dinner?, The Trees of the Dancing Goats and many, many more. It’s a magical time of year and we try to capture as much of that wonder and whimsy as we can. I am tired now just writing all of that! However you celebrate, we hope you have the happiest of holiday seasons filled with light, family and friends!